It IS the season to be jolly! 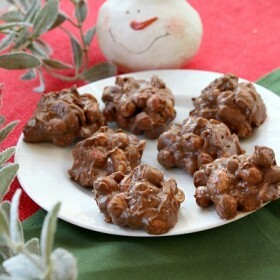 Today I made an edible Christmas craft that kids love. Get ready to be amazed…. 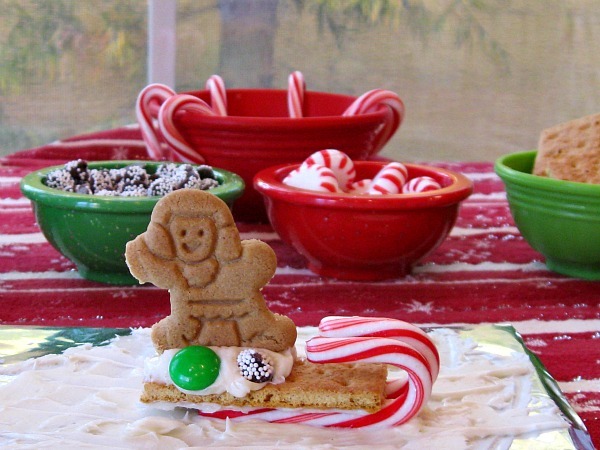 I made Gingerbread Sleds! The cool thing about them though is that you can customize each sled. I used a foil covered cardboard to get started. 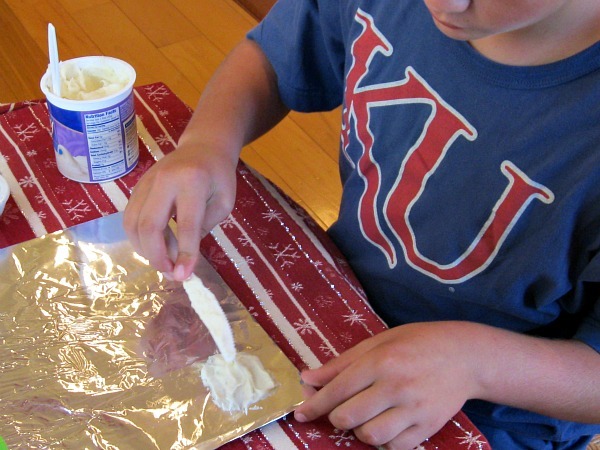 Try to use the flat part of a knife to spread the frosting around otherwise ridges will show up. You want the frosting (snow) nice and thick to be able to stick a sled in it. 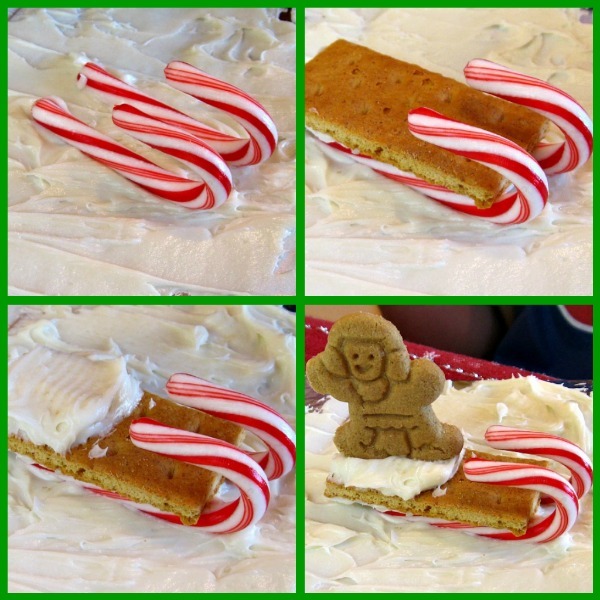 First you need to place the two small candy canes firmly into the “snow.” Spread frosting on the bottom of 1/4 of a graham cracker and place it on top of the candy canes. This creates the actual sled part. 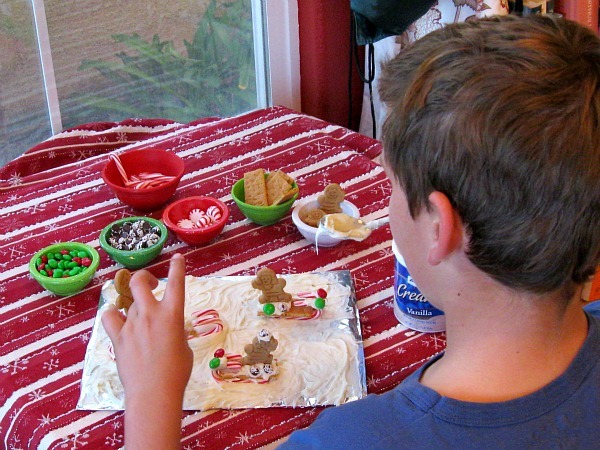 Next, spread more frosting on top of the graham cracker. 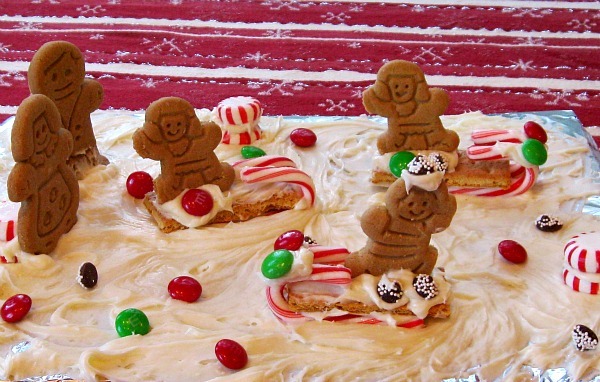 Finally, add a gingerbread man or woman on top of the frosting. Now you can customize your sled with M&Ms or any candy/decoration that you have lying around. After you have done all of the steps above, you can decorate the snow and add bystanders to the happy holiday scene. This craft was GREAT! It is handy to have around too because at different times if you want just a taste of something sweet, you can just grab a fingerful of frosting and a couple of M&Ms to chow down on. Parents, if your kids are bored during winter break because their friends are on trips, this is a great time-taker-upper and it’s super easy. GREAT job!! I Love this idea! I am amazed! These are so fun! 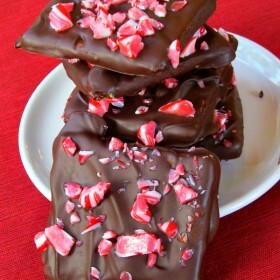 These look awesome, not to mention delicious!! do you have a recipe for gingerbread cookies by any chance? I just used a bag of store-bought gingerbread cookies for this project. These are great! Can you share where you found the gingerbread people? this was such a fun edible craft to do with my three boys and all the ingredients were easily found at the local grocery store. We added mini gingerbread marshmellow men! Thanks for showing us something so fun and super easy we could all enjoy! I’m glad you made this! It was a fun project. Maybe when you move next door, the boys can come over and help me cook! Loved watching you do this special Christmas craft. Sounds like it was a good one to share with other kids waiting for the big day. Very creative! I just found these on pinterest & I must say I love your shirt from a fellow Jayhawk, ROCK CHALK!! !